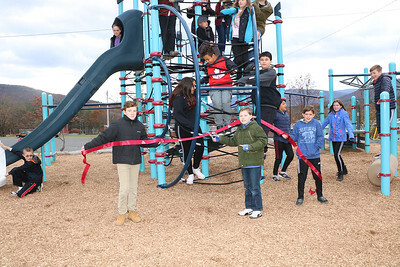 Bennett Elementary School’s Student Council held a ribbon-cutting ceremony on November 27 to mark the official opening of the school’s new playground. Holding the ribbon are (from left to right) Student Council Secretary Sean Hallinan, President Linus Driscoll, and Vice President Che Spiotta. 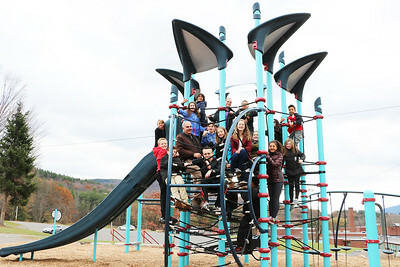 Members of Bennett Elementary School’s Student Council pose for a photo on the school’s new playground, which opened on November 27. Joining them was Jared Mance, Onteora's Director of Facilities and Operations. 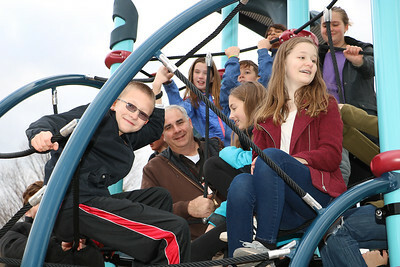 Jared Mance (second from left), Onteora's Director of Facilities and Operations, joined members of the Bennett Elementary School Student Council for a photo on the school's new playground, which opened on November 27. 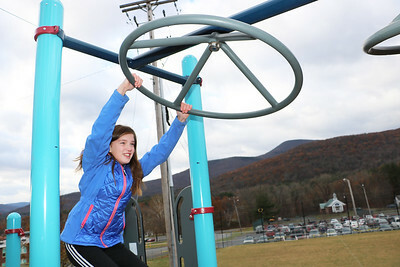 Bennett Student Council member Rachel Williams tries out the equipment on her school’s new playground, which opened on November 27.